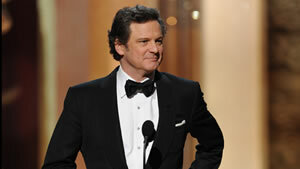 Colin Firth joked that he felt his career 'just peaked' after winning the Best Actor Oscar at the 83rd Academy Awards. Although he was hotly tipped for the accolade, the Chiswick actor appeared genuinely delighted when his name was read out. And he delivered yet another witty acceptance speech saying "I have to warn you I am experiencing stirrings somewhere in the upper abdominal region threatening to form themselves into dance moves. "Joyous as they may be they would be extremely problematic if they get to my legs before I make it off stage." The star studded event belonged to The King’s Speech which won four Oscars from its 12 nominations, including Best Picture, Best Director (Tom Hooper) and Best Original Screenplay (David Seidler). Colin Firth also won a Golden Globe, a BAFTA, and Screen Actor's Guild for his portrayal of stammering King George VI.